Lango teachers are trained to use modified language, placing emphasis on high frequency words and communicative targets that are meaningful for learners at their respective ages. We use visual cues, body movements and EXPERIENCES to move students away from outdated translation methods so that they can form a link between language and ideas without relying on their native language. Our curriculum combines Big ideas with Essential Questions geared towards students needs and interests to ensure that their experience is both meaningful and engaging. Students are encouraged to use their imaginations and "play" in the language, lowering language anxiety. It is our hope that our mindfully developed Creative Content builds confidence and motivates students to be lifelong language learners. All of our classes incorporate authentic cultural activities. Students often play traditional games, listen to a rich variety of music in the target language and engage in art projects that imitate cultural practices. Lango classes are created and taught with the intention of giving students a meaningful and memorable experience. To facilitate this, we use Big Ideas and Overarching Themes in each class. The content and communicative goals are based on these ideas and themes. 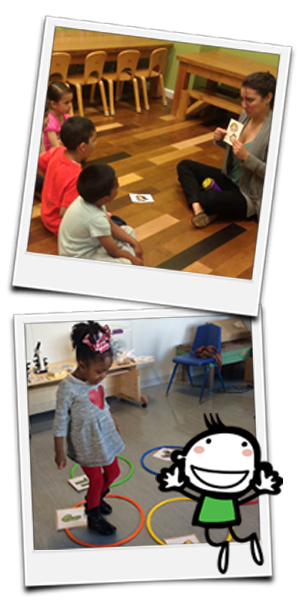 We are continuously updating our topics and activities to stay consistent with children’s interests. For example, students learning about clothing words will leave class with the ability to describe their style preferences and hypothesize as to how style reflects their identity. We make memories with our students by meeting these goals with exciting activities like playing Guess Who or competing for a position as a professional shopper for a cartoon character using the vocabulary and target skills. All of our curriculum is created with the intention that students leave Lango with concrete communicative skills. All Lango language goals are developed around domain language tasks. As students engage in an activity where they work with teammates to design a map of an imaginary city, incorporating as many ice cream shops or toy stores as they desire, they are practicing life skills and real situations that they will encounter. The communicative goals will provide students with the skills to ask for and understand directions, or to describe their favorite places in their community. Lango classes are student centered. After modified input has been “taken in” and comprehension is achieved using games, challenges and dramatic play, students are then given the chance to use the language in communicative, task-based activities that require problem solving, creativity and cooperation. At Lango we understand that language learning is a process that depends on first understanding the language, then having the opportunity to use the knowledge in a unique way. We strive to give students multiple opportunities to use the language in each class.